With Access File Password Recovery - a useful solution to unlock Access file, unprotect access file and users can easily open password protected MS Access files. Software is a specialized application to unlock access file and to unlock access security. With Access File Password Recovery ? users can recover access file password, reveal access password from access file protected with lost or forgotten password and retrieve access file password in a few clicks. With Access File Password File Recovery tool, the process to recover access password becomes more easier and users can recover access file password instantly and efficiently. Access File Password Recovery successfully unprotect access file protected with heavy protection as this software can recover complex and lengthy password from ms access file. Recover multilingual password easily with Access File Password Recovery tool. 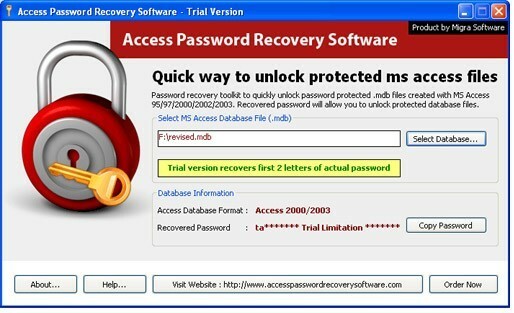 Software is extremely easy to use Access password recovery utility. Software can recover access file password from almost all versions of MS Access (MS Access 95/97/2000/2002/2003). Users can run the software on any version of Windows 98/ME/2000/2003/XP/Vista. Access File Password Recovery tool will enable its users to unlock access file instantly and quickly. Network Password Manager - Multi-user software for storage, management and protection of data containing passwords in enterprise. Data security is provided by 256 AES encryption. Easy to administrate, comfortable for users! Passwords Generator - Simplest way to get random and difficult to crack passwords is to use Passwords Generator. This program is incredibly simple in use, but the same time it allows all necessary functions. Now you can create countless set of passwords with one click. Passwords Base - Passwords Base will keep all your passwords in a secure database, so you only have to remember one single master password. A clickless and intuitive interface makes it easy to manage your passwords. Portable Efficient Password Manager Pro - Efficient Password Manager Pro is a cross-platform password management application. She can help you remember generic passwords, software registration codes, e-mail account passwords, etc. You can sync data across PCs and mobile phones. Efficient Password Manager - Efficient Password Manager is a free but cross-platform password management application. She can help you remember generic passwords, software registration codes, e-mail account passwords, etc. And you can sync data across PCs and mobile phones. Efficient Password Manager Pro - Efficient Password Manager Pro is a cross-platform password management application. She can help you remember generic passwords, software registration codes, e-mail account passwords, etc. You can sync data across PCs and mobile phones. Efficient Password Manager Network - Efficient Password Manager Network is a powerful password management application. It is specially designed for small to medium workgroups to share data! To grow your business in no time! Elcomsoft Phone Breaker - Perform logical acquisition of mobile devices running Apple iOS, Windows Phone, Windows 10 Mobile and BlackBerry 10. Retrieve information remotely via iCloud with or without Apple ID and password, decrypt iOS backups and FileVault 2 volumes.